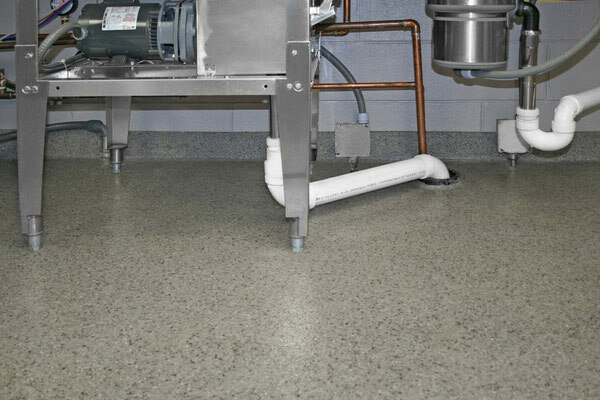 Most new facilities start with a satisfactory floor. This soon changes once that floor is subjected to severe exposures. 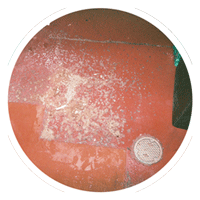 After three to five years, most floors in this industry have visible signs of deterioration. 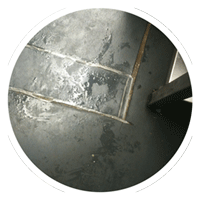 In many cases, water and bacteria are collecting in the space between the floor and the substrate, creating an unhealthy environment. So the real question is: How long do you want your new floors to last? After a short time, the grout around a quarry tile floor will absorb dirt, bacteria, grime and liquids. This wears away the grout, which will start chipping. Once the grout is loose, more gunk will start leaking through to your subfloor. Now you have a nice petri dish of germs, chemicals and insects happily working to destroy the glue that’s holding down your tile. Once that’s gone the tiles start popping up, and just like that, you need to start all over with a new floor. Sound like fun? 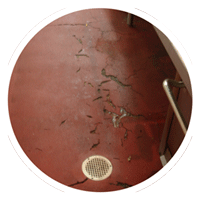 What about a cementitious urethane floor? 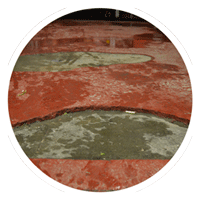 Because cementitious urethane is a form of concrete, it is prone to pinholes and condensation. Tiny pockets of moisture could be retained during the curing process. These microscopic holes can retain microbes and debris, and will shorten the lifespan of the coating tremendously. The inevitable cracks on the surface and the unsanitary conditions will become a costly and time-consuming problem. 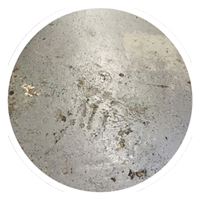 Sheet floors with heat-welded seams, such as rubber flooring, PVC, and vinyl, are vulnerable to tearing at the seams, heat damage, and punctures. Once the layer has been breached, contaminates can get underneath and wear away the adhesive. Once that happens, it’s only a matter of time before the floor sheeting will begin coming loose, and then it’s time to start over. Other epoxy flooring will look great for a while. But because it is so thin and brittle, it will begin cracking with time, and the thin epoxy coating on top will wear away. Your once new flooring begins chipping, flaking, breaking into chunks, and showing one heck of a wear pattern. Won’t Anything Work on a Long Term bBasis? 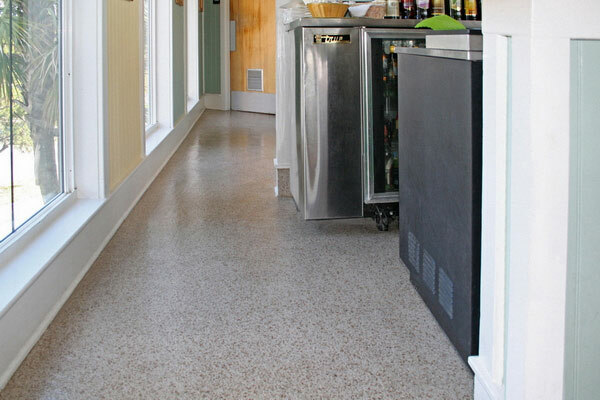 The secret to long lasting floors is Everlast Epoxy’s thick, flexible and tough seamless system! We use only the highest quality epoxies on the market. We always use the correct amount of aggregate and lots of epoxy! Other epoxies are 60 mils thin. Everlast® Floor is 160 mils thick! Our flooring has epoxy throughout the product, not just a thin layer on top! It can stand up to wide variations in temperature and heavy foot traffic for years, and still look like new. It has an EPA registered antimicrobial additive, so you don’t have to worry about microbes, mold or bacteria. Everlast Epoxy Flooring is non-porous, so you don’t have to worry about any water leakage getting under the floor. Our floors also have excellent chemical resistance against urine, strong detergents, and disinfectants. Everlast® Floor is a monolithic, custom-formulated, troweled-on system that forms a physical bond between the material and the surface to which it is being applied and vulcanizes them together. The compound this process creates is bonded together so tightly that corrosive materials cannot penetrate to begin the deterioration process. Because there are no crevices or cracks, there’s nowhere for bacteria to breed, and there’s nowhere for insects to hide. Best of all, there’s nowhere for dirt and grime to build up and make an unhygienic mess.